After many requests I have designed the sedge stitch slouchy hat uk, you can wear it as a fashion accessory or it is ideal to cover those bad hair days lol, I have made it in an easy textured stitch to give warmth on a 5.00mm hook and made it in a three color combination to fit an adult head. Pull up loop from each of next 2 stitches, yrh, pull through all loops. Row 3 – 1ch, (1dc, 1tr) into base of ch1, * miss 1tr, (1dc, 1tr) into next dc, * rpt from * to * to last tr, miss tr, ss to the first dc on the beginning of row. Turn. Rpt Row 3 twice. Fasten off. Rpt Row 3 thirteen more times until 18 rows have been worked in all from beginning or work measures approx 5 Inches. Fasten off. Rpt Row 3 seven more times until 25 rows have been worked from the beginning or work measures approx 7 Inches. Fasten off. Rpt Row 3 seven more times until 32 rows have been worked from the beginning or work measures approx 9 Inches. With WS facing join colour 1 to starting ch edge, work 1ch, 1dc into base of 1ch, 1dc into each ch to end, ss to first dc on beginning of row. Fasten off. Finishing – Working on WS thread loose length of yarn evenly through dc and gather the top, weave in and trim off any loose ends of yarn. Hope you enjoy this free crochet pattern for a sedge stitch slouchy hat, make sure you pin for safe keeping. The written instructions and pictures for this freesedge stitch slouchy hat uk pattern are copyrighted to crochet ‘n’ create © 2017. 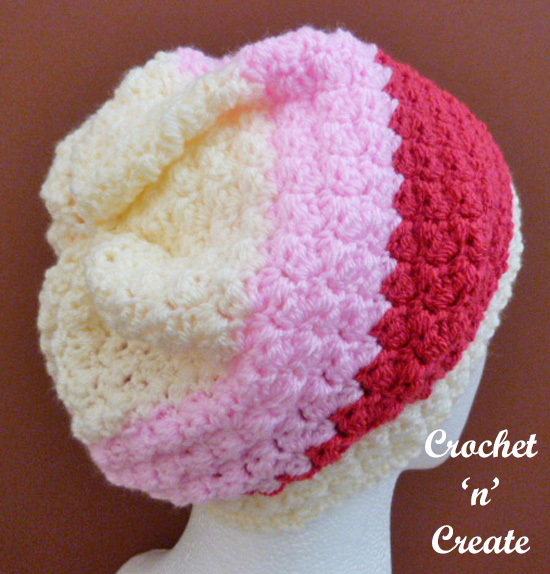 You are welcome to sell the finished products made from the free crochet sedge stitch slouchy hat uk pattern, I just ask that you use your own pictures and put a link back to crochet ‘n’ create. If you wish to share this crochet sedge stitch slouchy hat uk pattern on your social media or your blog please only use a direct link to the pattern page on crochet ‘n’ create. 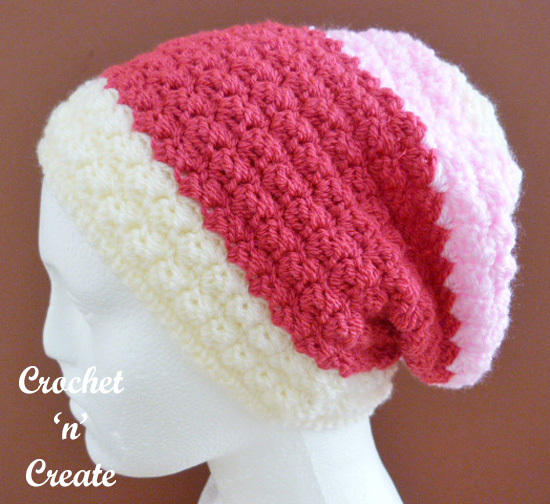 This entry was posted in free crochet patterns, Slouchy Hats and tagged crochet, crochet hats, crochet slouchy, free crochet patterns on 13th October 2017 by crochetncreate.